We offer a wide variety of fitness classes for people of all fitness levels including Bootcamp, Zumba, Vinyasa Yoga, Hatha Yoga and Tai Chi. Get fit and join us! 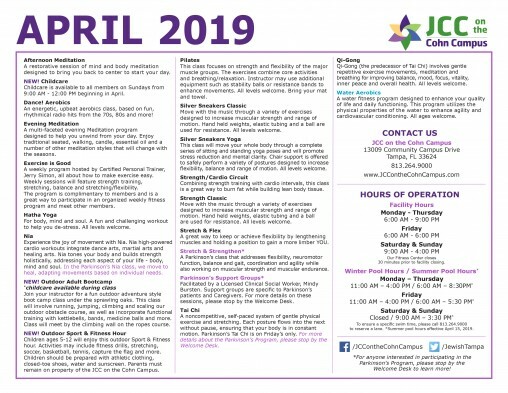 The JCC on the Cohn Campus offers a variety of classes for seniors with the SilverSneakers® Fitness Program, an innovative health, exercise and wellness program helping older adults live healthy, active lifestyles. Get fit, have fun, make friends! We offer SilverSneakers classes including YogaStretch, Muscular Strength & Range of Movement, and Silver Splash. Learn more. Challenge yourself with this fun adventure fitness series. A restorative session of mind and body meditation designed to bring you back to center to start your day. Childcare is available to all members on Sundays from 9:00 AM - 12:00 PM beginning in April. An energetic, upbeat aerobics class, based on fun, rhythmical radio hits from the 70s, 80s and more! A multi-faceted evening Meditation program designed to help you unwind from your day. Enjoy traditional seated, walking, candle, essential oil, and a number of other meditation styles that will change with the seasons. A weekly program hosted by Certified Personal Trainer, Jerry Simon, all about how to make exercise easy. Weekly sessions will feature strength training, stretching, balance and stretching/flexibility. The program is complimentary to members and is a great way to participate in an organized weekly fitness program and meet other members. For body, mind and soul. A fun and challenging workout to help you de-stress. All levels welcome. Experience the joy of movement with Nia. Nia high-powered cardio workouts integrate dance arts, martial arts and healing arts. Nia tones your body and builds strength holistically, addressing each aspect of your life - body, mind and soul. In the Parkinson’s Nia class, we move to heal, adapting movements based on individual needs. Join your instructor for a fun outdoor adventure style boot camp class under the sprawling oaks. This class will involve running, jumping, climbing and scaling our outdoor obstacle course, as well as incorporate functional training with kettlebells, bands, medicine balls and more. Class will meet by the climbing wall on the ropes course. Children ages 5-12 will enjoy this outdoor Sport & Fitness hour. Activities may include fitness drills, stretching, soccer, basketball, tennis, capture the flag and more. Children should be prepared with athletic clothing, closed-toe shoes, water and sunscreen. Parents must remain on property of the JCC on the Cohn Campus. This class focuses on strength and flexibility of the major muscle groups. The exercises combine core activities and breathing/relaxation. Instructor may use additional equipment such as stability balls or resistance bands to enhance movements. All levels welcome. Bring your mat and towel. Move with the music through a variety of exercises designed to increase muscular strength and range of motion. Hand held weights, elastic tubing and a ball are used for resistance. All levels welcome. This class will move your whole body through a complete series of sitting and standing yoga poses and will promote stress reduction and mental clarity. Chair support is offered to safely perform a variety of postures designed to increase flexibility, balance and range of motion. All levels welcome. Combining strength training with cardio intervals, this class is a great way to burn fat while building lean body tissue. A great way to keep or achieve flexibility by lengthening muscles and holding a position to gain a more limber YOU. A Parkinson’s class that addresses flexibility, neuromotor function, balance and gait, coordination and agility while also working on muscular strength and muscular endurance. Facilitated by a Licensed Clinical Social Worker, Mindy Bursten. Support groups are specific to Parkinson’s patients and Caregivers. For more details on these sessions, please stop by the Welcome Desk. A noncompetitive, self-paced system of gentle physical exercise and stretching. Each posture flows into the next without pause, ensuring that your body is in constant motion. Parkinson’s Tai Chi is on Friday’s only. For more details about the Parkinson’s Program, please stop by the Welcome Desk. Qi-Gong (the predecessor of Tai Chi) involves gentle repetitive exercise movements, meditation and breathing for improving balance, mood, focus, vitality, inner peace and overall health. All levels welcome. A water fitness program designed to enhance your quality of life and daily functioning. This program utilizes the physical properties of the water to enhance agility and cardiovascular conditioning. All ages welcome. *For anyone interested in participating in the Parkinson’s Program, please stop by the Welcome Desk to learn more.